On September the 15th a group of scouts headed to Southampton docks to have an amazing experience on a steam ship that was launched in 1955. We arrived at the scout hut in the morning the Warspite mini bus drove us to Southampton where we arrived at the sight of the ship where our experience had already begun. We were put into three groups of six and (one group was from another scout group). My group started up in the Bridge where the ship is controlled, we were showed the radars and equipment still in use dating back to its original making as well as the more modern controls and equipment and how it worked as well as how they would use them in certain situations. 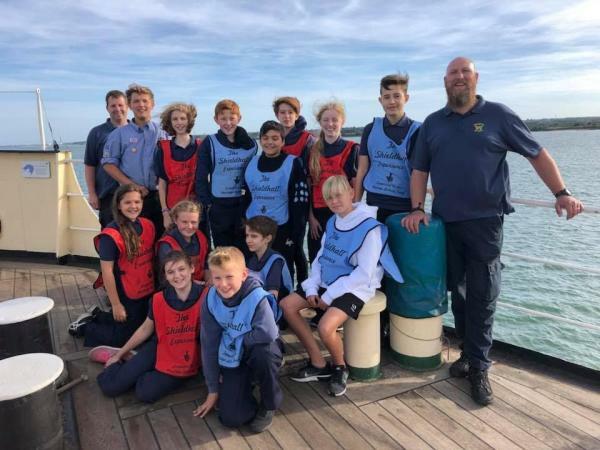 Our group then exited the boat by climbing down a side ladder into a small motor boat where we drove the motor boat taking turns around the surrounding Southampton dock area with the Sheidhall volunteers accompanying us. Next we were taken to the side deck where we learnt about fire safety and had a go with different types of fire extinguishers before then given the chance to use a giant fireman’s hose and spray it into the water off the side of the deck! After that we then went down to the Engine room to see how everything worked and the volunteers were happy to tell us how. Later on when the boat set sail we were able to pay many later visits to the engine room to see the machinery at work. Finally, we did an activity on the upper deck seeing how far we could throw the throw lines onto the bank without them hitting the water and then learning how to knot and tie ropes at different times and the uses on the boat to which we then had a very clever tug of war where one single knot could hold all of the group pulling on it. Then we used the original equipment to learn how injured sailors would be safely transported off the boat. Eventually after a lunch break the boat set sail and we admired the sights of Southampton before then returning with many thanks to the Shielhall crew. We then headed home to a fantastic day out! An experience not worth missing!